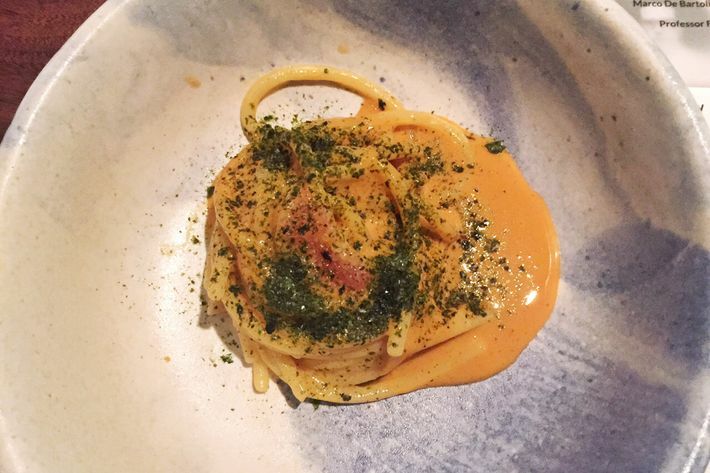 If your Instagram feed looked a little wonky last night — why’s Danny Bowien in Noma’s kitchen? — it’s because of S.Pellegrino’s the Grand Gelinaz! Shuffle. The same group responsible for last year’s over-the-top tribute dinner to Wylie Dufresne staged another grand event: Thirty-seven of the world’s greatest chefs left their homes, traveled to a new country, and simultaneously cooked in each other’s restaurants. Adding to the whole thing: Diners had no idea who would be in the kitchen until they arrived at the restaurant. 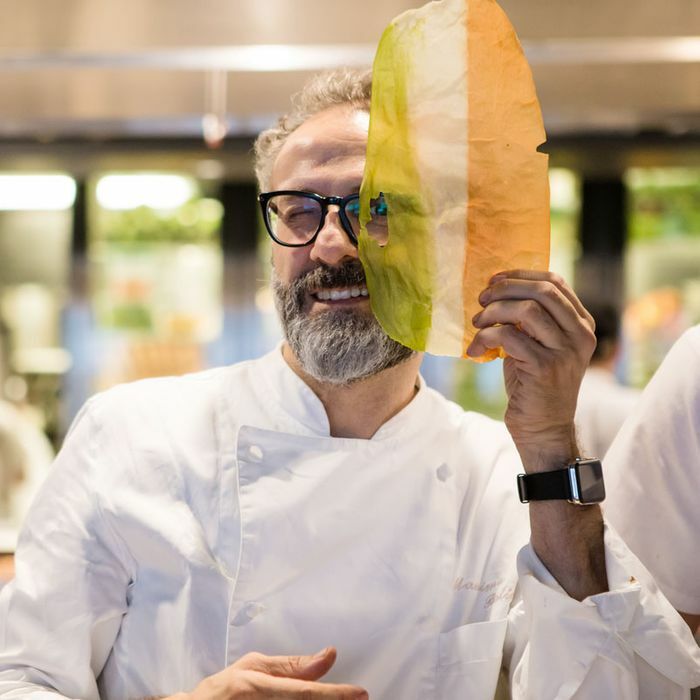 The team at Momofuku Ko welcomed Massimo Bottura, of Osteria Francescana in Modena, Italy — which was just ranked No. 2 on the “World’s 50 Best Restaurants” list. Grub caught up with Bottura right before service and spoke to him about how he felt about stepping into David Chang’s restaurant, opening his own kitchen up to Sean Brock, and what went into crafting and preparing his menu for the evening. To start, when did you find out that you’d be cooking at Ko? One month ago is when they extracted all the names and the places that were switching. When I learned that it was the restaurant of one of my best friends, I was like, “Oh, fantastic.” I feel I know New York so well, and it would be very, very easy for me to do it. I arrived on Monday night. And I know Ko so well, so everything is going pretty smoothly. How does it feel to have another chef in your restaurant, working with your staff? My place is like a family. Most of the people have been working there with me for seven, eight, or nine years. We don’t have a restaurant. We have a staff of 43 for 30 covers. So I know Sean [Brock] — he was very, very moved. Everyone is telling me that there is such a great energy. It’s very cool. He’s not used to that kind of restaurant. How have you been preparing for your meal? Did you bring any ingredients over with you? My best ingredient is my mind. I mean, I travel with my mind. One thing I think that is very important is not to get a revolution in the kitchen, but to let the cooks feel safe. So what I did is I contaminated New York ingredients with my mind. And for me, it’s so easy to do that. I can feel New York in my blood. Can you tell me about some of the dishes you’re going to cook tonight? The opening dish is a half a wheel of Parmigiano Reggiano, and I brought with me a little bit of the balsamic vinegar that we own. It won the gold medal of Spilamberto last year as the best balsamic in the world. The first plate is going to be corn of the cob: a spoon of custard with very concentrated broth, and a sauce of a smoked butter and crunchy corn. You don’t know if it’s a dessert or an opening. We put a little bit of vanilla inside. Are all of these dishes brand-new for this evening? Yes — most of them. The corn on the cob, I create and I serve just once before. The James Beard Foundation asked me to cook the Fourth of July party at the Milan Expo, and we did this dish. There’s also going to be a surprise from the audience, because I involve Wylie Dufresne. He has a seat reserved; I’m going to give him a jacket. We’re preparing his shrimp and grits, one of his signature dishes at wd~50, and we’re going to say, “Oh, guys, tonight we have a special guest, so this plate is by Wylie.” You know, like at a rock concert! So I want everyone to clap their hands for Wylie and I’m going to serve that dish. Yeah, it’s very cool. But this whole event is about that. The meaning of the event is that. It’s not about me. It’s about us. It’s about breaking walls. It’s about sharing. I’m giving Francescana to Sean Brock, you understand what I mean? It’s unbelievable. It’s like Alain Ducasse is giving Plaza Athénée to someone else. It’s unbelievable. It takes a lot of trust. Yeah, trust. So after Wylie, we’re going to serve something that is a mixture of culture between me and Dave [Chang]. I’m doing a plate that is called, “From Naples to New York Passing Through Hokkaido.” I put together three different spaghettis. My first thought was spaghetti la carbonara, but if I pass through Hokkaido, I can not make carbonara. So, starting from Naples, I have aglio e peperoncino — a very classic recipe from Naples. After that, I have linguine with clams, but I’m opening the clams and smoking them, so the smokey taste serves as a guanciale. And the juice is going to be used to finish the the aglio e peperoncino. And then, to finish, passing through Hokkaido, I found the best sea urchin in the world. I mix the sea urchin and I simmer it as an egg yolk for carbonara. So it’s going to be clams, aglio e peperoncino, and sea urchin spaghetti. That sounds incredible. Any other pasta dishes? I’m going to serve lasagna, but it’s very, very different lasagna. Just the crunchy part of the lasagna that we are cooking, dehydrating, frying, smoking, roasting, and give that smokey, burnt taste. It’s the crunchy corner or the lasagna that every single child knows is the best part. For the raggu, I’m going to mix it with bone marrow to give it the richness, as well as kimchi. I’m going to give this sour taste in raggu to make sure that everyone understands that this is Ko. And I’m from Modena, but I’m cooking in Ko. People have to know where they are. If it’s a success, would you consider introducing it back in Italy? This kind of preparation would never be accepted in Italy. The raggu is unbelievable, but Italy is such a traditional place that if you think about these kinds of flavors, they would never understand, you know? But New York is New York. It’s a place of open minds, so for me, it’s okay. Are you preparing a Damien Hirst-inspired dish? Yes, the next course is going to be lamb. I found a fantastic lamb from Colorado, so we are cooking a plate that is called “Beautiful Sonic Disco of Love and Hate at the Gate of Hell Painting With Wicked Pools of Glorious Color and Psychedelic Spin-Painted Lamb, Not Flame Grilled.” We are transforming a classic plate as lamb with all the side dishes in multiple colors. This is one of my most famous plates. It’s inspired by Damien Hirst’s spin painting. Did you consult with Chang at all? I was going through the plates at Ko and evolved them, and matched them with my ideas. For example, one of the plates is the shaved foie gras. It’s one of the classics of Ko. And what I did is I kept the shaved foie gras, and I changed the whole bottom part. So in Eataly, I bought villa manodori and dark-cherry vinegar. And in Union Square I found sour cherries, dark cherries, and white cherries. So i mixed the dark cherry balsamic vinegar with the white cherries. The sour cherries I left natural, and the dark cherries I mixed with a very old, sweet Riesling. The three cherries match with the crunchy almonds, and are served at the bottom for a shaved foie gras. 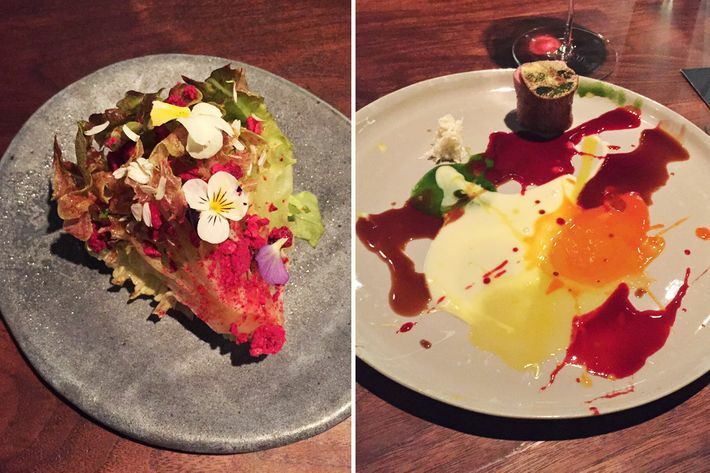 What kind of budget did Gelinaz! give you? It’s a very low-budget meal, except for the foie gras and the lamb. We have to keep the budget that is the budget of the restaurant. That’s very important because it’s just about the level of the restaurants. Have you spent time with any of the other chefs in town? I know that Alex Atala is here. Where have you eaten while you’ve been in New York? I went to Carbone yesterday, because Mario is a very good friend. And I went to Cosme. I’m staying at the NoMad and it’s fantastic. I’m going to eat at my friends’ places, because I feel like I can go to Le Bernardin or Daniel and I feel at home. Last time Daniel was embarrassing me, just like my old brother, you know? It is so amazing this kind of relationship we have. We change the experience of all the restaurants. The cuisine is growing so much because of this kind sharing, breaking, and transforming of culture. Since you just placed No. 2 on the World’s 50 Best list — competing against so many of your friends — are you now eyeing the top spot? Me? Never. We just enjoy what we do, and I think the Roca brothers deserve to be No. 1 again. We don’t cook to be No. 1. We don’t cook to be No. 2 or 3 or 4.